There never seems to be enough time in the day, and while you can’t add hours to the clock, you CAN work to make each hour you do have more productive. 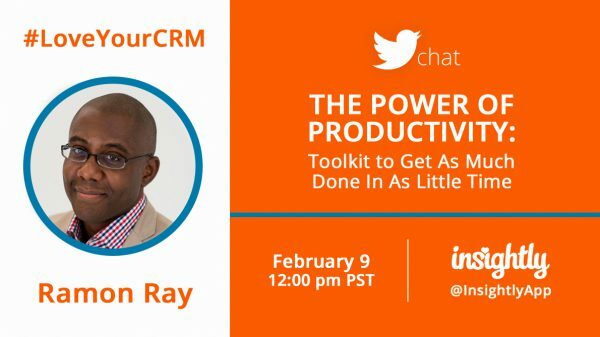 If you have tips to share OR want to learn some new techniques, then you are going to love my latest Twitter Chat with Insightly, entitled The Power of Productivity: Toolkit to Get as Much Done in as Little Time. The secret to success as a small business owner really isn’t a secret at all. PRODUCTIVITY is the reason why these entrepreneurial superstars can get so much done in a day whereas the rest of us are still chipping away at a mile long to-do list and wondering if we made any progress at all. Share tactics and tools that will help you get more done in less time. Show you how to “hack” your clock to increase productivity during working hours so you can enjoy more time with your family and friends. Reveal techniques that real entrepreneurs use to boost productivity in both business and life. To attend and participate in a Twitter Chat, you simply have to follow the event hashtag (which in this case is #INSIGHTLYCHAT). By doing so, you will be able to follow the conversation and see what everyone is saying. And when you use the hashtag, you too will become part of the conversation. Enter the event hashtag (#LoveYourCRM) and hit Go. Authorize TweetChat to connect with your Twitter account (this is required). You are then taken to a ‘room’ that will show ALL Tweets with that hashtag. You can like, retweet, or reply to anything you see, just like in Twitter as normal. If you want to contribute, just type your tweet in the box – it will automatically add the event hashtag for you, so you will be part of the conversation. Sounds easy, right? Well block an hour in your schedule on February 9 at 3 P.M. EST and join me for a chat that will help boost your productivity!